While it was a performance for the ages, Mark Messier’s hat trick in leading the Rangers back from the brink of defeat to a 4-2 victory over the Devils in Game 6 of the 1994 Eastern Conference Finals only guaranteed that the Blueshirts would be able to play a decisive Game 7 on their home ice on this date 15 years ago. As inspirational as the win was in Game 6 at The Meadowlands, the Rangers still had to find a way to beat a team that, through six grueling games, had proven to be their equal in many ways. And then there were those ever-present ghosts of 1940 standing between the Rangers and their first trip to the Stanley Cup Finals since 1979. The players would not publicly acknowledge those ghosts, but everyone felt the weight of 54 years of unanswered prayers. 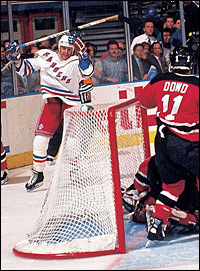 Stephane Matteau reacts to his double-OT goal in Game 7 of the Rangers' playoff series victory over New Jersey on May 27, 1994, at Madison Square Garden. Such was the nerve-wracking run-up to Game 7 on May 27, 1994, for the Rangers. The first period was played in an electric atmosphere at Madison Square Garden, the fans desperately trying to make a difference for their beloved Rangers. Both teams had solid scoring opportunities, but goaltenders Mike Richter and Martin Brodeur -- as they both had been throughout the series -- were both right on top of their games. The Rangers had the better scoring chances in the first period, but Brodeur held them off the scoreboard, and after 20 minutes of intense play, the match remained scoreless. An interesting note was that on a team chock full of star-caliber talent, it was three role players -- Sergei Nemchinov, Esa Tikkanen, and Brian Noonan -- who stood out for the Rangers with their aggressive offensive play and sturdy two-way play in the game’s opening period. However, in the second period it would be one of the club’s true superstars who would step forward and start making a difference for the home team. Rumored to be playing hurt -- and just three games after being benched by Mike Keenan -- Brian Leetch built off a solid first period to begin dominating in the second. Leetch created several prime scoring chances for his teammates before making a breathtaking move midway through the contest to open the scoring himself. Mark Messier won a faceoff to Adam Graves, and the rugged winger quickly fed Leetch along the left-wing boards. Leetch sped forward, lost Bill Guerin with an amazing spin-o-rama move, and subsequently slid a backhand shot past Brodeur to give the Rangers a 1-0 lead at 9:31 of the second. It was a big-time play by a big-time player. And it was among the more memorable snapshots during Leetch’s run to the ’94 Conn Smythe Trophy as playoff MVP. Despite the beauty and artistry -- as well as the clutch nature -- of Leetch’s goal, the Rangers still only had a 1-0 lead, and though they outshot New Jersey 11-5 during the middle stanza, they could not add to their advantage. In fact, it was Richter who had to make a pair of dazzling saves in order to keep the Devils off the board during the second period. His stop on Bobby Holik’s in-close one-timer was huge, but largely overshadowed by a scintillating toe save made on Claude Lemieux’s breakaway shot later in the period. Twenty minutes away from reaching the Stanley Cup Finals, the Rangers hit the ice with a one-goal lead in the third period. And just 6:32 into the third, Alex Kovalev was whistled for the Rangers’ first -- and as it would turn out, only -- penalty of the night. Though there was a noticeable nervous air with The Garden Faithful, the Rangers’ penalty killers -- with Leetch and Jeff Beukeboom standing out -- killed off the minor, and were now nearly halfway through the final period. It seemed as each minute ticked off the clock, the roar from the crowd grew louder, though that clock did not move nearly fast enough for Rangers fans. Neither team could generate much offense, both playing nearly flawless defense with the Rangers perfecting the art of retrieving the puck in their own end and clearing it out as quickly as possible. Nemchinov had the best scoring chance for either team in the third, and it came very early on. The quiet Russian sent a perfect deflection towards the net only to see Brodeur make yet another stellar stop and keep the Rangers’ lead at one goal. In the final minute of regulation -- with the crowd in a near frenzy -- the Devils pulled Brodeur for an extra attacker, and twice the Rangers iced the puck -- setting up faceoffs in their own end. With less than 20 seconds to go, Richter made a save and looked to play the puck, but the referee blew his whistle quickly before Richter could. That set up yet another big face off in the Blueshirts’ end of the ice. With everyone at The Garden on their feet and roaring, the Devils controlled the face off, with the puck coming down low to Lemieux along the goal line. Lemieux whipped a pass across the crease to Valeri Zelepukin, who snapped a quick shot that was stopped by Richter. However Zelepukin reached in and shoved the rebound under Richter with 7.7 seconds left to play, and incredibly the game was tied 1-1. As the Devils celebrated and The Garden became eerily silent, Richter charged the referee -- furious that the whistle had not been blown as quickly as it had on the previous play. And somewhere inside MSG the ghosts were laughing at the most recent cruel twist of fate that had befallen the Rangers. Perhaps what would eventually set the 1994 Rangers apart from other past teams in franchise history that failed in the big moment took place in the locker room during the intermission between the third period and the first overtime. Several veterans spoke - most notably Messier and Kevin Lowe -- and a calm confidence was restored. There would be no anger. There would be no panic. Instead the Rangers would remain steadfast to their game plan and aggressively chase victory. The Rangers dominated the Devils in the first overtime period, outshooting the visitors 15-7 and outchancing them by a wide margin. Messier, Leetch, and Noonan all had prime scoring chances. Brodeur, though, withstood everything the Rangers sent his way. At the other end of the ice, Richter was stout, stopping both Holik and Scott Stevens on separate odd-man rushes during the fourth period. 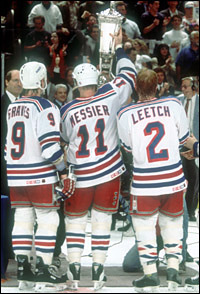 Rangers captain Mark Messier is joined by alternate captains Adam Graves and Brian Leetch in raising the Prince of Wales Trophy after the Rangers beat the Devils for the 1994 Eastern Conference title. When the horn sounded signaling the end to the first overtime, Rangers’ fans were exhausted and drained, and did not know whether to think their club’s dominating play was a good sign or inability to beat Brodeur was a sign of eventual doom. The players, though, remained confident that eventually they would find a way to get another shot past Brodeur. However, the Rangers almost did not have that chance. The Devils had just one shot on goal during the second overtime period, and it took a remarkable play by Richter to save his team’s season. New Jersey’s Stephane Richer streaked towards Richter four minutes into the second extra session and unleashed a bullet towards the cage. Richter made an incredible glove save, and then desperately dove to knock the puck towards the corner and out of danger. As the fans -- and Richter’s coaches and teammates -- let their hearts settle back down out of their throats, a deflection off Tikkanen forced the puck in deep to the left-wing corner in the Devils’ zone. Stephane Matteau, who had won Game 3 of the series with a double-OT goal, swooped in and beat Scott Niedermeyer to the loose puck. Matteau then carried the puck behind the Devils’ cage and emerged on the other side, where defenseman Slava Fetisov was charging towards him. Matteau proceeded to put a wraparound shot off Brodeur’s stick and over the goal line at 4:24 of the second overtime to set off a wild celebration, both on the ice and in the stands at MSG. 2-1 victory in Game 7 for the Rangers! 4-3 series win for the Rangers! It took all seven games, including three decided in double overtime, and a heroic comeback from a 3-2 series deficit, but the Rangers were finally moving on to the 1994 Stanley Cup Finals. Though history would provide many more amazing memories during the Finals against the Vancouver Canucks, it was very hard to believe on May 27, 1994 that it could get any better than this.